Well, let me guess, you have your travel mode on and intend on starting your own travel page on Instagram and a YouTube channel as well but do not want to spend too big on a high-end DSLR just yet? Or are you just a newbie photographer or want to click photos as a hobby? Irrespective of your needs if you are looking for a DSLR on the cheap, this is the place to be. Below we tell you everything you need to know in order to get the best DSLR in India under 30000. From brand, models to the features that matter the most, this is the ultimate guide you NEED. 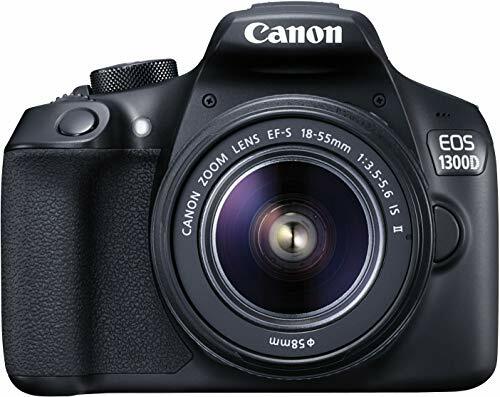 Canon EOS 1300D: Not as advanced as the Nikon D3400, but covers every basic feature a newbie needs like a 3s continuous shooting speed, 18MP resolution, built-in Wi-Fi and a high-quality lens, all at a much lower price. If we are talking about DSLR’s and not mentioning a Nikon then are we really even talking about DSLR’s? Yup, they are a brand that good and their D3400 is one of the best entry-level DSLR’s and here is why we think so. With an ISO of 100-25,600, the Nikon D3400 practically guarantees you awesome shots even in low light without making it too noisy (your night photography is going to get a whole lot better). And while I know it is often not the most important feature, megapixels do matter. So with a 24MP lens, the D3400 will help you capture the minutest of details for the sharpest of prints. But the biggest asset about this camera is the inclusion of SnapBridge. So what does this do? Well, you can now share your clicks on the go as it transfers them directly into your smartphone or even the laptop with a Bluetooth Low Energy Consumption Connection (BLE) even when the camera is off. Also, it uploads them directly to the Nikon Image Space so you get a backup of your images on the cloud without even pressing a button. Not to forget, you can access it anywhere anytime using your mobile, laptop etc. Don’t your friends and family love candid photos when you catch off-guard at their best? The problem, they most often turn out blurred but not anymore. How can we be so sure? That is because the D3400 is equipped with an 11 AutoFocus point and has a shooting speed of 5 frames per second (you are never missing out on priceless smiles, laughs and tears again). Along with the D3400, you get the AF-P DX NIKKOR 18-55 mm f/3.5-5.6G VR and the AF-P DX NIKKOR 70-300 mm f/4.5 – 6.3G ED VR kit lenses. With these lenses, you can not only do high-speed photography but also record videos in Full-HD and do not worry about the slight jerks and movements as the image stabilization takes care of it all. But what if you have never used a camera before? Thanks to the built-in guide mode, you can learn all the basics there is to operate it and clicking expert shots within days. And once you get the hang it and would like more control over the images, you can switch to the Picture Control Mode. To help bring out the creative beast inside, the camera also features 10 special effects like night vision, miniature effect etc. all accessible with the click of a button (so now you do not have to waste 100’s of hours on Photoshop to create every effect). And if that alone does not help, since the camera stores images in RAW format, you get greater control over the post-processing as this format stores all information captured by the sensor (not something the JPG format is known for). The rugged texture of the camera gives you a firm grip and to help capture far off details it also has an 8x digital zoom and 1x optical zoom. Also, since it is ultralight at a mere 395 grams carrying it in your backpack or the camera bag should be a breeze (or just hang it around the neck like the pros 😉 ). 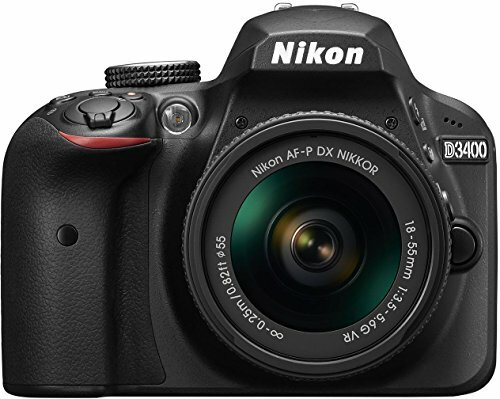 Note: The D3400 is most likely to be the last in the very popular D3000 series as Nikon wants to lay more focus on high-end and full frame cameras. So if you ever wanted to get your hands on a Nikon on the cheap, this may well be your last chance so DO NOT MISS OUT. We are being very picky here but an in-built Wi-Fi would have been perfect. Plus, you cannot shoot in 4k. Canon has been a brand synonymous with DSLR’s whether it is budget models or professional-grade cameras and the EOS 1500D shows exactly why. The Canon features an ISO of 100-6400 which means you get clear photos whether it is a bright sunny day or even the night. If need be, you can even increase it to 12800. And you do not have to worry about noise spoiling your images as well since the camera is equipped with the APS-C CMOS sensor & DIGIC 4+ image processor. So what do these fancy terms do? Simple, these help you get the best possible output in any lighting conditions by capturing ample light. This is then processed by the & DIGIC 4+ image processor giving you color gradations that are sure to leave viewers in awe of your images. I am pretty sure the next question on your mind is, how many megapixels is it, right? Well, just like the D3400, it will give you detailed videos and images with a 24MP lens. Also, do you ever wish you could click those images with the perfectly blurred background? Well, thanks to the large sensor, getting that all important depth of field is now a cakewalk. The 9-point autofocus isn’t as good as the D3400 but sure does a great job of getting those special moments on the double. The 3-second continuous shooting speed plays quite the helping hand as well. All videos are shot in Full-HD while the image stabilization takes care of any shakiness or blurriness that may occur due to the quick movement of the camera. And if you happen to be social media birdie, uploading images to your followers and fans can be done directly from your smartphone. Just pair the camera with the mobile using Wi-Fi and Connect Camera App. But what really tops this, is that you can even use the app for clicking images (so no one, especially you, are never left out of the special group selfies again). As for all the shooting goes, you can either opt for the ViewFinder or turn to the LiveMode which gives you all the display on the 3” LCD screen. And to help you set the right tone and mood for each photograph there are 5 filters. Plus, since images can be stored in RAW format, you have every control you will want in post-processing. Lastly, this too is quite light and compact as it weighs just 476g and comes with a rugged texture making it anti-slip as well. The lens kits EF-S 18-55 mm IS II and EF-S 55-250 mm F4 5.6 IS II are quite good as far lens kits go but are limited when it comes to serious professional photo shoots. It also does not support 4K videos. Who does not want to get the best bang for their buck, right? And this Amazon best-seller gives you exactly that. 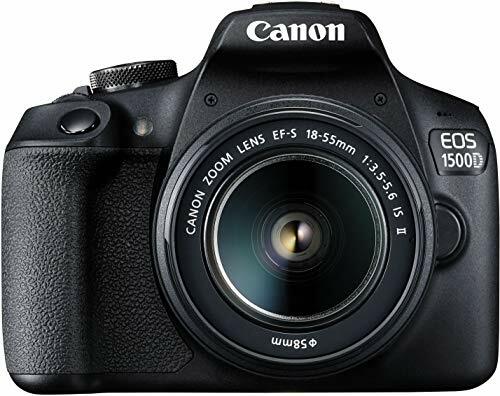 The EOS 1300D is very similar to the 1500D on many fronts. Firstly, this too has an ISO range of 100-6400 which can be bumped up to 12800 as per the situation. So this gives you better control over the light so images come out top-notch in both the day and the night. But what about the noise? That is where the DIGIC 4+ processor comes in handy and gives every click the colors, contrast, and details you wanted to click them for (because that what you and every image deserves). It also has the same large APS-C CMOS. So you can have fun with the shallow depth of field images where your subject and background separated by blur making those images even more powerful. A few touches on the smartphone and just like that you can have the best images on your Instagram, Facebook etc. with a simple connection between your camera and Connect Camera mobile app via the Wi-Fi. With the app, taking those lovely group photos without leaving anyone out also becomes a breeze as it lets you control your camera. You can also set prints or connect to an HDTV or photo sharing services like Irista (clicking and sharing photos hardly gets any easier than this). For those quick moving shots in a party, marriage or while traveling, this camera also has a 9-point auto focus and 3-second continuous clicking speed that perform well in decent lighting. You also get multiple modes so you can bring the crazy in your images with a miniature mode or the toy camera mode. Or use the Video Snapshot mode or a nicely combined montage of all your precious memories (in difficult times, even your camera can be your best friend). Oh, by the way, yes all your videos are shot in Full-HD to give you and your clients crystal clear viewing experience. And for beginners, there is a detailed Feature Guide that explains all the menu systems so you can be navigating through it all like a pro in a matter of days. The weight, design, and build are also very similar so can be carrying it around however you like it (backpack, carry case or around the neck, the choice is yours). For all your post processing needs, there is also an option for storing images in RAW. Last of similarities are the viewing options. Again, you can either stick to the Viewfinder or switch to the more flexible 3” LCD Screen. One of the differences between the 2 Canon 1500D and 1300D is the megapixels. While the 1500D is 24MP this is just 18MP. Better than any mobile but misses out on details the 1500D wouldn’t. Secondly, it has a whopping 18X zoom (nothing is ever too far away for this bad boy). The EF-S 18-55 mm IS II and EF-S 55-250 mm F4 5.6 IS II lens kits are again not one any professional would want to be using but you can always get an upgrade. Also, with 18MP, it does not capture as much detail as the Nikon D3400 or the Canon 1500D and you can neither shoot in 4K. It also has no image stabilization and thus needs extra care when shooting videos. With DIGIC 4+ image processor, images come out with better colors, contrast etc. You can use modes like miniature mode or the toy camera. 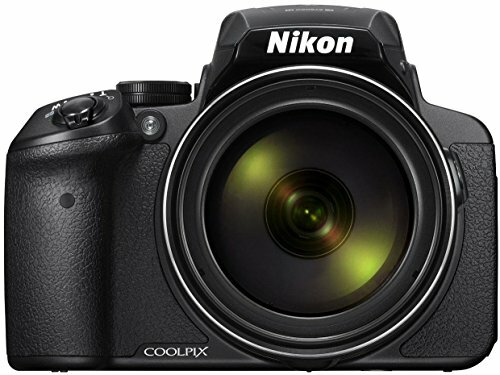 Another one of Nikon’s top models in this price range, the Coolpix P900 has plenty of top features to make you fall in love with it. If you thought 18X zoom was a lot, did I tell you about 83X zoom the P900 offers? (Yup, I can almost see that open mouth and wide eyes). That means your camera can even capture things your eyes cannot see or even wider angles that most cameras can’t. And to help you make the most of the zoom feature, the button has been placed on sides in order to avoid shaking. But what are a high zoom and wide angle lens without good quality images? So here’s more about the P900. The tilt 3-inch LCD screen lets you shoot low and high angle shots with utter ease (no back-breaking with this one). You also have the option to switch to monitor shooting and can go back to the viewfinder shooting without the press of a button. How? The sensors automatically detect the eye and make the switch for you. You can also have your most-used functions assigned to the Fn button. This allows you to shuffle through your favorite settings in a matter of seconds with the single button. Delivering exceptional videos is the Full-HD lens with image stabilization. And it is not the video but the sound too that follows the zoom to an extent so you get pinpoint accurate sounds as well for your movies. Plus, if you love time-lapses as much as we do, you will be happy to know that creating those surreal time-lapses is just the press of a button away. Just like most cameras, even this can be connected to your mobile via the Mobile Utility App 6 available for both Android and iOS. But this connection is not just limited to file transfers or remote camera operation, there more you can do. For those bitten by the travel bug lately, you can also track longitude, latitude or distance between various buildings or landmarks thanks to the GPS, GLONASS, and QZSS support*7 (and trust us, it is damn accurate as well). To help you shoot the glory of the mountains or majestic green fields, the camera comes with a special ACTIVE mode. This severely reduces the lag times to about 0.12 seconds at wide-angle and 0.75 seconds at the telephoto position so your images and videos are destroyed by the dreaded BLUR and are more stabilized. Similarly, there also the Bird-Watching or Moon mode for the other hobbies you might have. Okay, so we have talked about tons of things but what about photography in the night? Well, that is precisely why the camera has an ISO of 6400. And before you ask me about the noise it might generate, that is well-taken care by the Super Extra-Low Dispersion Glass element. Lastly, it also has a rugged texture so it does not simply slip out of your hands and also comes with a carry case that prevents it from any damage and dust. Well, it is only a 16MP camera. While that still gives you pretty good photos, a higher resolution would have been better. Also, it does not store images in a RAW format which gives you less control over the post-production. The app lets you track longitude, latitude etc. with GPS etc. Noise problem on high ISO is taken care of by the Super Extra-low Dispersion Glass element. We like this point to point camera mainly because it eliminates one hassle of a DSLR and that is having to buy different lenses for zoom and wide angles. And the day it comes with a RAW format, I think that is the day most people would be ditching the DSLR for this one. Want something on the cheap? Well, forget 30k, here is one excellent DSLR you can grab for less than 20k. Interested? Read more about it below. First and foremost, it is quite surprising that a low-costing camera comes with a 20.3MP resolution which means you get pretty detailed images. But that is not the only surprising thing. To camera has been tailor-made for low-light photography as well with maximum ISO of 3200. Low, but yes, gets the job done with clarity and little noise thanks to the DIGIC 6 Image Processor. Not to forget it comes with 50x Zoom and a 100x Zoom Plus so you can capture those distant objects when some high-end DSLR’s cannot (just the kind of thing a traveler wants to hear). Just like other Canon cameras, this too connects to your mobile giving you the freedom to share your adventures and stories with your social media follower’s minutes within each click. If you happen to find yourself in for a selfie with the locals, just place the camera and the shoot button via your mobile. The videos you shoot will be all in Full-HD and the smart image stabilization system lends a helping hand in keeping them shake-free. The autofocus makes the camera a nifty one when it comes to shooting those decisive quick shots where you just have a moment to capture something beautiful. And just in case you are nostalgic and want to take a trip down memory lane, the Story Highlights mode is just what you need. That is because it creates a short 2-3-minutes storyline from all your images, videos, short-clips etc. along with a song of your choice from the in-built music library (just like any best friend should). The ergonomically designed body is easy to grip and just as an assurance, Canon did not forget to give it a rugged texture in case you ever hold with wet or slippery hands. It is also light at just 440g and with a carry bag, moving around with this camera as you hustle will be quite easy. Don’t forget, the carry bag also keeps the camera safe and dust-free. Well, 20MP is higher than expected not nonetheless not as effective as 24MP would have been. Low light photography is good but ISO is just 3200 which limits its capabilities. Compared to the other models, the image and video quality is also average. Simply put, this is a no-frill DSLR that any starter Vlogger or photographer should grab onto Why? Because, firstly, it is really cheap and secondly, because it gives an output that can leave anyone impressed considering the lower price range. Buying a camera is no easy picking especially for newbies because truth be told, there aren’t many budget cameras available. So we did the digging, picked out the 5 best DSLR Cameras in India under 30,000 so you can never have a bad picture again. In case you need any more help or have something we missed out on, feel free to connect with us anytime by dropping a comment below.